February saw solar generation almost double its output compared to last year, and India looks certain to beat the 100,000 GWh of renewable grid power for the 2017/18 financial year. 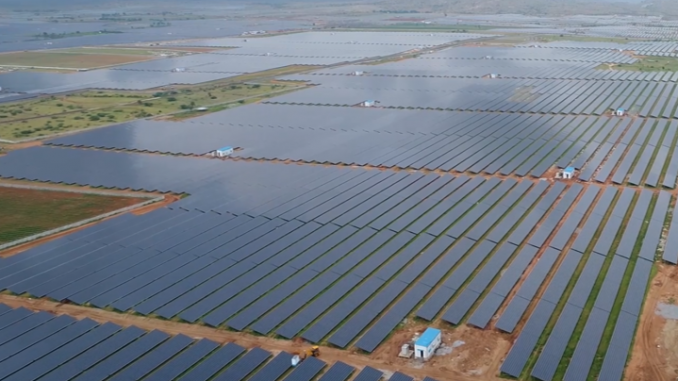 New capacity came on stream with the first 600MW of the world’s largest solar park – the 2,000MW Pavagada solar park in the State of Karnataka (pictured above). At the time of writing – 12:34 pm local time, the Pavagada plant was supplying a healthy 493MW to the grid. In addition to power, Pavagada will supply local farmers with rental income that the very arid land was unable to produce from farming. In fact, the region has reportedly been drought-declared 54 times in the last six decades. The remaining 1,400MW capacity is expected to be up and running by the end of 2018. Solar made up 35% of February’s renewable grid power, up from 15% just two years ago, as the chart (below) shows. In total, renewable energy was up just over 30% year-on-year. While wind is not a major contributor at this time of year, it will pick up in coming months as the monsoon approaches, and more renewable generation records can be expected.